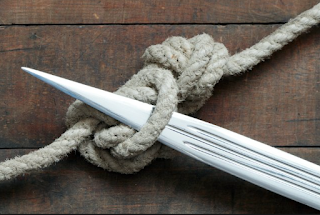 There is a Gordian Knot with asset allocation as we move into 2016. The problem is simple but fundamental to all asset allocation this year. If interest rates are going higher, what happens if stocks do not go higher. Moving out of bonds and not stocks may not protect principal. The premise on switching between these two assets classes is based on the negative relationship between stock and bonds that have existed for a fairly long time albeit not guaranteed. Investors are in a difficult situation of the negative correlation does not exist in 2016. The 2016 assumption is that the Fed will normalize rate and we will thus see higher rates across the yield curve. The higher rates are based on expected higher inflation and higher growth. If there is higher growth, there will be an expectation for higher earnings based on higher sales which will boost stock prices. Similarly, there will be higher inflation if there is a higher growth. Because earnings are adjusted with inflation, equities will be a better asset or hedge if there is inflation. The result is a negative correlation between stock and bonds. If you don't like bonds, you should like stocks. If you cut your bond exposure, then you should increase stock exposure. But what if this relationship does to hold? How do you protection principal and reduce risk if the negative correlation between stocks and bonds does not hold in 2016. You are stuck in a horrible investment situation if rates rise and stocks fall. This is easily possible if the risk premium on bonds increases even though there is no further economic growth. It is possible the Fed raises rates in a bad economic environment. The only solution to this problem is to find non-correlated assets to stocks and bonds. You have to find alpha generators. Alternatives serve as the solution to this two asset class allocation knot problem. This is why the recent JP Morgan Institutional Investors 2016 Survey shows the largest net change in alternative allocation decisions going to global macro. 16% of survey participants expect to add to this strategy. Unconstrained long/short beta can get around the problem of changing asset class correlations. This knot solution is why there has been continued interest in alternatives even though there has been significant under-performance relative to hedge fund return targets. Natixis survey - what are institutional investors thinking for 2016? 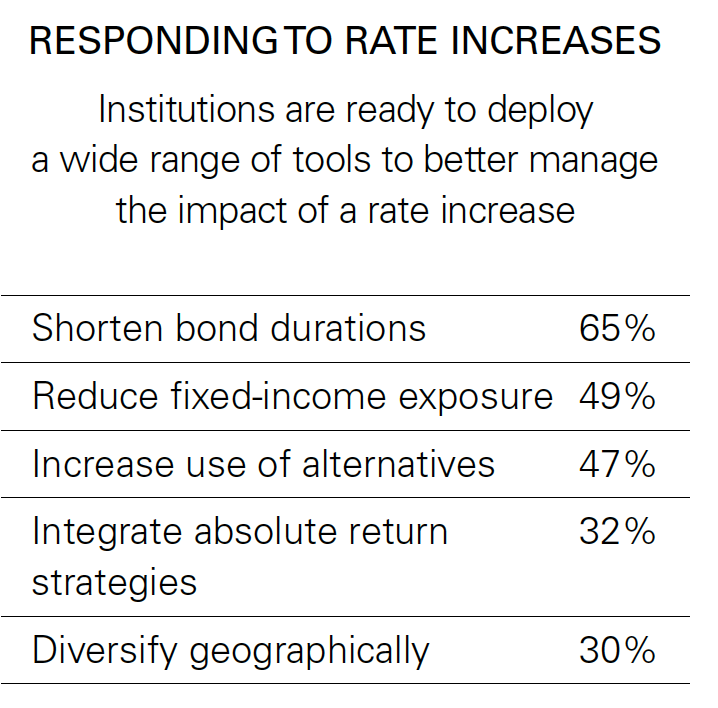 Many firms are now engaging in surveys to provide insight on the direction of asset allocation choices of large investors. Natixis Global Asset Management just released their 2016 survey of institutional investors which provides interesting reading. It tells us that institutions want efficient diversification, different asset class and strategy choices that efficiently use capital. The top objective for institutions is not about growing or preserving capital but achieving the highest risk adjusted returns. This plays nicely into the higher demand for alternative investments. The one thing that hedge funds do well is more efficiently use capital and this seems to be the desire of investors. Of course the big elephant in the room for any investor is the threat of higher interest rates from a Fed normalization. 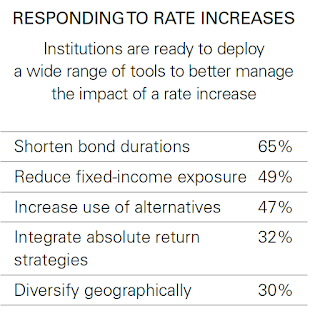 2/3rds of institutional investors plan to shorten bond durations as a way to respond to this threat. Unfortunately, lower durations comes at the cost of lower yields. Protection against rate increases will cost yield in the short-run and lead to lower realized portfolio returns. This is another reason for the increased demand for alternatives. 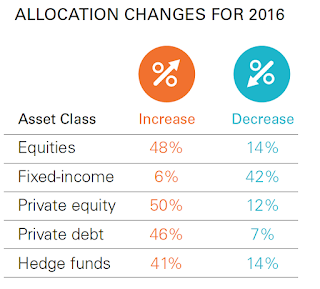 The largest decrease in allocations will be to the fixed income asset class. The largest increases will be toward equities and private equity. It is interesting that while rates are expected to increase, there is a desire to hold more equity during a period of Fed normalization. The expectations is that real rates will rise from improved growth and there will be higher inflation based on a strong economy. Equities are being viewed as an inflation hedge with expectations for higher earnings. There is the implicit belief that a bad bond environment is a good stock environment based on continued negative correlation between the two main asset classes. That is an assumption that may not be realized. Still, there is a strong desire for holding alternatives as a means to break-out of the two asset diversification between stocks and bonds. From the survey, the main driver for holding alternatives is diversification and not alpha generation. The value of risk mitigation falls right behind the demand for alpha generation. 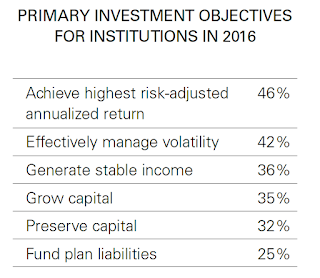 The core problem with 2016 for institutional investors is clear. There is an expectations that rates will rise, but the alternative of holding more equities may not be palatable. This means that alternative investments will have to serve as the go-to place for diversification and risk control. Mercer view for 2016 - what does it mean for portfolio construction? The reduced liquidity theme has been the talk of both investors and regulators. Investors are getting more risk averse given the potential for liquidity events. Police-makers either do not want to admit their is a problem or believe they are not the cause of any liquidity shortfall. Nevertheless, they have increased their focus on macro prudential policies which include monitoring liquidity. Our view is that a reduced liquidity environment calls for greater exposure to short-term trading strategies. Liquidity providers will be rewarded. A maturing credit cycle is evident with the explosion of high yield credit spreads. Credit is becoming scarcer and investor are asking for greater risk premia. This credit repricing process is just beginning, so the our view is that switching out of credit in the short run is a good defensive strategy. The tilt from beta to alpha is justified given we are likely to see further repricing of risk in equities. While the ECB, PBOC, and BOJ are all adding liquidity, the Fed's shift to normalization creates a potential headwind for holding risky assets. Low volatility has continued even after the spike of last August. This is likely to change. We view that market correlations will decline given the decoupling of policies. This means that relative value trades will be better rewarded than buy and hold directional positions. Find alpha that exploits lower market correlations. The "think long-term" view is a catch-all for the fact that, in the short-run, uncertainty will be high and the ability of investors to get direction right may be difficult. This may be in conflict with the idea of active trading in a illiquid world, but we see this as the other end of the liquidity spectrum. In this world, holding long-term strategy allocations make sense if you cannot or do not want to take advantage of changes in risk aversion and liquidity. Sentiment-driven market behavior - feedback or snap-back? 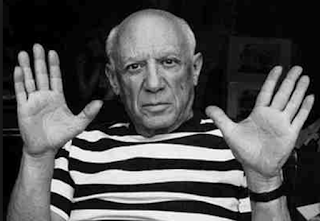 I believe that to a large extent, herding is at play. If other investors sell, it must be because they know something you do not know. Thus, you should sell…. So how much should we worry? This is where economics… gives the dreaded two-handed answer. If it becomes clear… that fundamentals are in fact not so bad, stock prices will recover…. [But] the stock market slump… can become self-fulfilling…. Hope for the first… worry about the second. Call it animal spirits, confidence problems, sunspots, self-fulfilling prophecies, sentiment, herding, noise traders, risk-on/risk-off, or multiple near-rational equilibrium, the markets are not following the fundamental news. Economist have a hard time when market move and there is not a clear link to fundamentals. The story that links fundamentals with the price action is often a complex form of expectations and game theory. Economist do not have a good or consistent name for this behavior of prices unrelated to news. The market may be turning because there is a change in expectations of fundamentals, but more importantly, there is a change in sentiment and markets are having a crisis of confidence. We express this divergence in behavior as a difference between exogenous versus endogenous risk. The endogenous risk or the risk from trading and price action is driving the markets. The exogenous risks form change in fundamentals have not been a critical driver of prices. This is a time when systematic trading based on price should be very effective. Don't focus on the fundamentals, but follow the trend and price action. 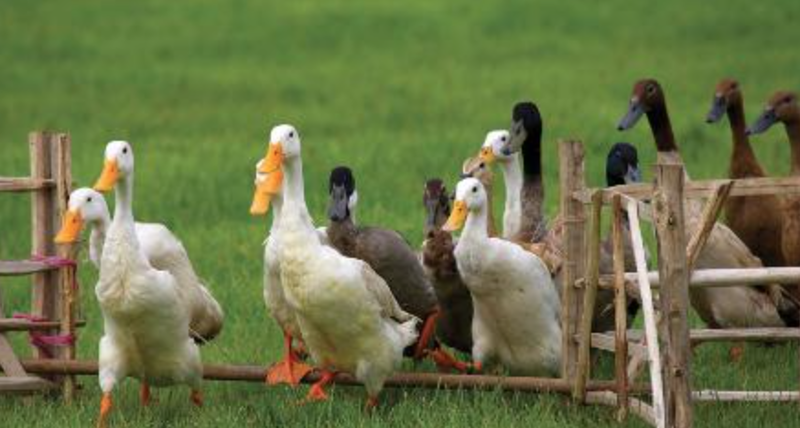 The market may be herding for a number of reasons. It could be a high level of uncertainty. There could be a new assessment in expectations. The reason is not always important. It is rational to follow the price action during these periods of transition. There could be a market snap-back from this decline. Generally, there are a lot of price snap-backs. Markets are usually mean-reverting or convergent, but there are times when there is a change in confidence such that mean-fleeing or divergence in markets is the dominant theme. This seems to be the current state. In this environment the price decline can cause a negative feedback loop and force business confidence lower. The markets will be in real trouble if that happens. Commodities are not like other asset classes. They will be affected by different factors from stocks and bonds. This is one of their key attributes. Commodities will offer unique diversification, but their uniqueness is also what will harm investors who think that they can just hold long-only exposure in order to receive consistent gains. Commodities cannot all be bundled together, energy markets are different from metals or agriculture. The commodity cycle is different from the business cycle and the cycle for each commodity is usually significantly different. The cycle for in-the-ground commodities is different form those that are mined or below-the-ground. The commodity cycle will generally last longer than a business cycle. Right now we are in the down portion of the cycle even though the overall global business is still positive albeit losing momentum. Commodity markets as accessed through futures will be subject to hedging pressure and short-term storage issues which are very different from equity and bond markets. This uniqueness means is that a combination of long and short positions across commodities, treating them uniquely, may be a more effective approach to investing than holding a long-only basket. Joelle Miffre from the EDHEC business school looks at all of the research in this area and shows that using simple strategies that combine long and short exposure to commodities will do better on a risk adjusted basis than holding basket, "Long-short commodity investing: A review of the Literature". This review work mainly focuses on the research that has tested the theory of storage and hedging pressure. Looking at forming long/short combinations based on backwardation and contango will generate good returns to risk across many different time periods. The same conclusion applies when testing a hedging pressure story. Investors are paid to take on the risk from short hedgers. This suggests that a long-short combination is an effective way to invest in commodities. The review also includes analysis of trend or momentum long/short portfolios and the combination of backwardation with momentum. Combinations work well for adding value. There have also been work on testing risk and skew portfolios which show that finding long/short combination is an effective strategy. While the downturn in the commodity cycle is a problem for long-only investing, there are other ways to invest in commodities that provide good risk adjusted returns and diversification without taking pure directional risk. This does not mean that the long/short strategies have always been winners, but it does say that long-only or avoidance strategies may be a portfolio view that is too extreme. There will be fads in asset management industry just like the fashion industry. Look back at the fashions in the 70's or 80's and you may just shake your head and ask, "What were you thinking wearing that?". The time has already come for investors to shake their heads about holding a commodity index and ask the same question. What were investors thinking? That said, the big dislocation between equities and commodities came after the Financial Crisis as evidenced by our graph between the S&P 500 and the Bloomberg commodity index. Commodities peaked in 2008 and tracked equities through the middle of 2011. Since mid-2011, equities and commodities have had a significant divergence. This was the post-QE2, beginning of the slowdown in China period. Commodities were a good trade when you were riding the wave of the up-cycle. The case for commodities ran through this long up cycle and seemed like a natural portfolio diversifier. Shortages and peak supply were the underlying stories for holding many commodities. With growth in emerging markets, demographics showing continued population increases, and the belief that technology would not provide a complete solution, commodities seemed to be a good long-term allocation decision. Add the fact that backwardation dominated a majority of the commodities markets and it seems like commodities as a good stand-alone investment and inflation hedge made sense as a stock and bond alternative. You could not have been more wrong since the Financial crisis and especially the last five years. Inflation has never arrived. 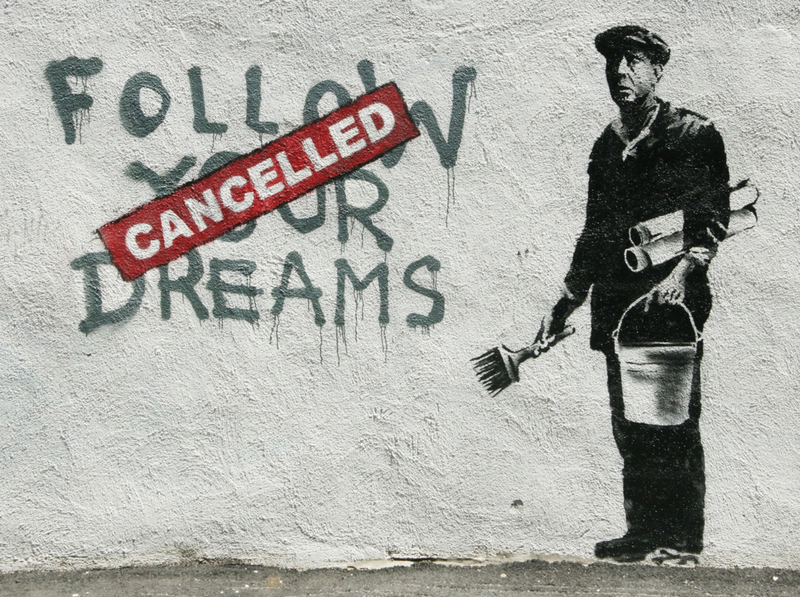 Deflation has become the story of the day. Cheap money did not lead to inflation but to an environment of continued investment and over production. Technology through shall oil solved one of the key peak commodity problems and served as a catalyst to the current price decline in energy. Emerging market growth as slowed and reduced demand for commodities. This has especially been the case for China. Some could argue that this was a perfect storm of negative supply and demand price shocks, but many of these shocks will extend for years. Demand from emerging markets will not change quickly. Technology will not reverse. Production shutdowns are necessary to offset past capital expenditures. However, an investment policy of avoiding commodities may be going to the other extreme. Commodities may offer significant opportunities but not from long-only investing through indices. Investor need to rethink the purpose of holding commodities and what are the correct return expectations. If the cycle for commodities is truly different from bonds and stocks, then the process for allocation also has to be different. 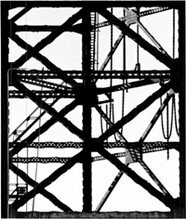 We have been big believers of Nasim Taleb's concept of "anti fragile" when thinking about portfolio building. You want a portfolio that will gain from uncertainty and not just be resilient. His book, Antifragile, was a path-breaking extension of his earlier work, yet it seems to have had limited impact on investment thinking. Those who have passed on these concepts are hurt. 2016 may turn into a year of disorder and transition. It certainly feels that way as we enter the third week of the year. If there is more uncertainty and market turbulence, investors should want a portfolio that will gain from disorder. Investors want a portfolio that will do well if government policies are mishandled, markets reactions are unclear, or models seem to give false signals. The world seems very fragile. We are less than a month away from the last FOMC meeting and there is already talk that rate increases should be on hold. Policy in China is more opaque than a year ago. The credit cycle seems to have turned. The international capital flow cycle has turned and there is concern about the global business cycle. Investors should not want a portfolio build for zero rates. 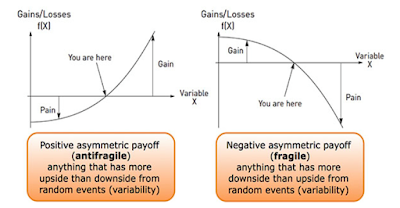 The antifragile portfolio will have a positive convexity bias and not be overly optimized. It will have a divergent bias. It will be less dependent on fundamental models and more dependent on market behavior. The current environment calls for a portfolio that has more trending characteristics regardless of time frame. A managed futures or positive crisis beta portfolio will do well in this environment. From Taleb's perspective you don't want a portfolio that is just resilient and bounces back from adversity. That would be a "sissy move". Investors should want a portfolio that will do well in this environment. Of course, if you feel that the economy is not doing poorly and policy-makers can learn from their mistakes and will get us out of the next jam, then a strong bias to an antifragile may not be your preference, but the risk is that you may be wrong. We already know the costs of policy mistakes from 2008. 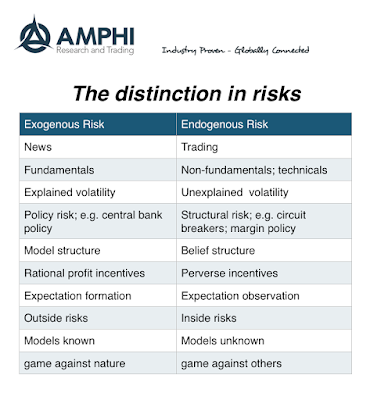 Risk can be separated into two types - exogenous and endogenous. 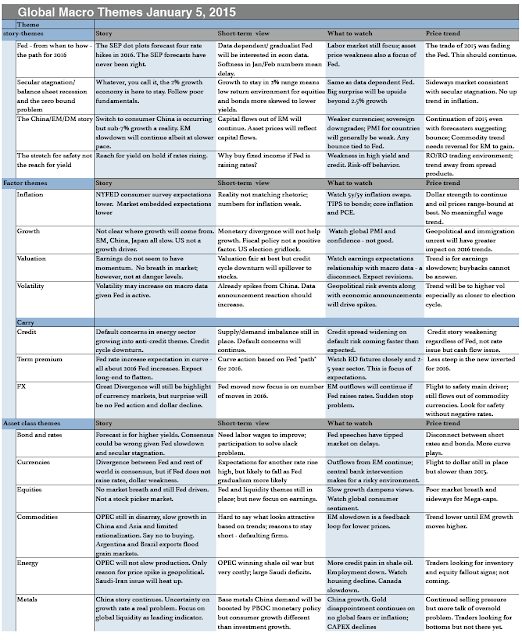 Exogenous risks are the ones that we most often discuss and model, but endogenous risks may be the most dangerous because they are not easy to describe or measure. 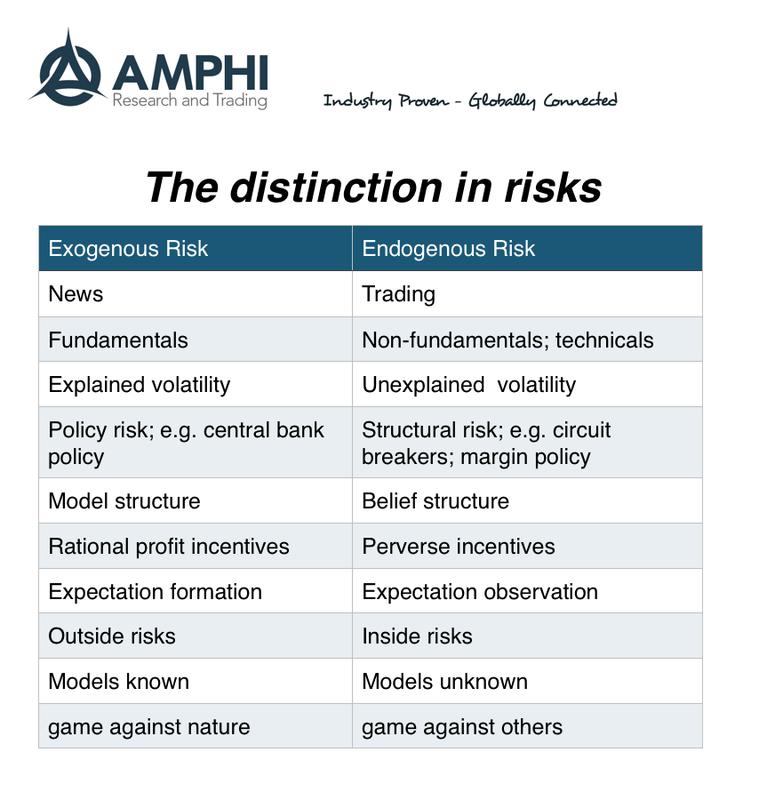 Exogenous risks are those associated with news - the fundamentals that drive markets. They can be the latest announcement from the Fed, or the new employment numbers. The risk from these announcements will be unanticipated, but the impact is often well recognized. These risks are the measurable or explained volatility in markets. These risks will be related to model structures. The behavior of traders and investors are well-defined and rational with respect to these risks. These risks help to formulate expectations because the models describing the economy are known. You could call the battle to measure and assess these risks as a game against nature. Endogenous risks are the risks derived from the trading in markets. These risks are the unexplained volatility that does not have a link with specific factors. These risk will be non-fundamental or associated with technical factors. The reactions to support or resistance will be endogenous risks. The risk to bandwagon or momentum effects will an endogenous risk.These will be beauty pageant risks - the risk associated with trying to handicap the expectations of others. These are the risks when the model of pricing is unknown. These are the risks with trying to second guess the expectations of others. It is a game against others. These risks are inherently non-linear. The work on the decomposition of risks was developed by Prof Modecai Kurz and popularized by Woody Brock. The framework has been around for over 20 years but has not gotten the interest it should. Much of stock decline in the last month can be associated with endogenous risks. The behavior of the markets themselves and the structure of trading has been negatively biased. There has been significant uncertainty unrelated to news. This is likely to continue and will not change based on the fundamental actions of policy-makers. There has been a new focus on market liquidity in the last year. Will bid-ask spreads increase? Will there be a shortage of liquidity so prices will move away from fair value when you want to execute? Will there be liquidity crises through swift downdrafts in price? All of these liquidity issues are important for investors, but they may not be the most important liquidity issues. There are more macro liquidity risks which can be more onerous and far-ranging. There is a distinction between macro and micro liquidity risks. Macro liquidity risks are associated with an asset class or broad set of markets and minimize the ability of investors to get out at any price. This could be regulatory restrictions on any sale. 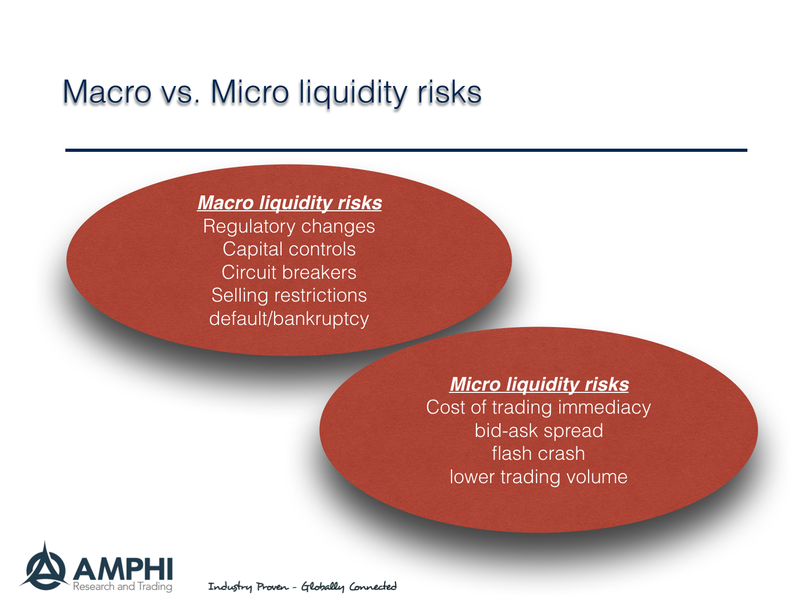 Micro liquidity risks are associated with the inability to get an immediate transaction done. Macro liquidity risk will come from regulatory changes or financial repression that limits the ability to trade. The restrictions on large shareholders ability to sell in China is a simple example.It is not a function of price. The transaction cannot be done. Capital controls would be a macro liquidity restriction. Circuit breakers and price limits are other examples. In the credit markets, bankruptcy and defaults which lead to restructuring will the ability of bondholders to receive principal. These restrictive rules are a part of finance. The risk is when it is unknown when these restrictions will be imposed. If you buy a liquid asset today, you don't know whether there will be future restrictions on your ability to sell in the future. If there is that risk, you may not buy the asset in the first place or at least ask for by return. Micro liquidity risk is associated with transactional immediacy. A flash crash, a widening of the bid-ask spread, and the lack of trading volume all affect the ability to get a price that will equal fair value. A transaction can occur, but the difference between price and value is unclear. 2016 is already becoming a year of macro liquidity risks. Focal points are the China equity and foreign exchange markets, but we are seeing more regulators focus on macro liquidity as a means of controlling downside risks that cannot be managed through current monetary and fiscal policies. The movement to macro prudential policies may impose macro liquidity risks on investors. This is not always bad, but it will cause a reaction by investors who will not hold risky assets that may be subject to these liquidity issues. The law of unintended consequences lives! 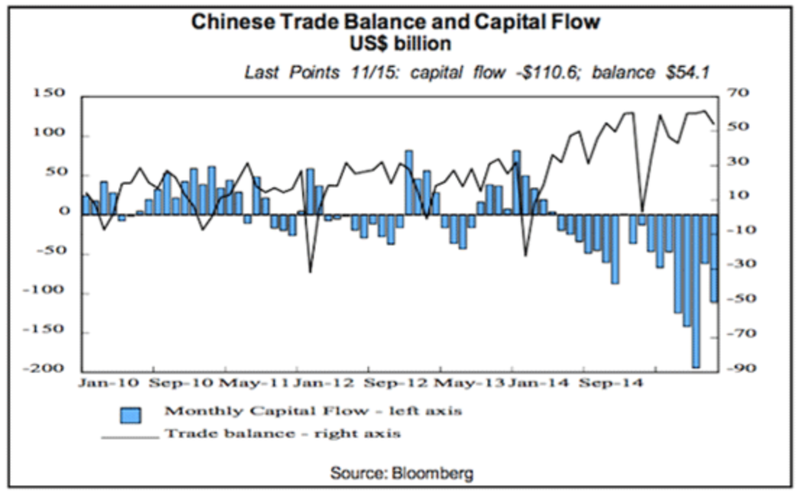 The capital flows out of China continue. It is like a financial diaspora of wealth moving to new parts of the globe in search of safety that was not expected just two years ago. The number are big and have an impact on the rest of the world. The real estate gains in some the leading cities around the world are driven by Chinese investors. Now, it makes sense to diversify out side a home country, but let's remember that China has been one of the fastest growing area in the world. The opportunities in China are still vast. 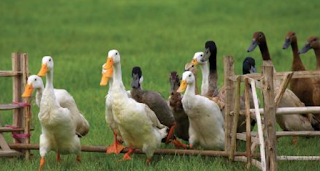 There is more going on than diversification; however, the explanation is rather simple. All things equal, wealth hates uncertainty. It can hedge volatility, but hates uncertainty. In particular, wealth hates anything that changes the rules of the game because then you cannot make the appropriate long-term inter-generational planning that can sustain past successes. Everyone can endure some uncertainty, but when uncertainty affects your ability to liquefy assets, you move the money. If you cannot move it offshore, you take the money out of risky assets and into what you may consider safe. Bank deposits have surged in China during the second half of 2015. This aversion to uncertainty or ambiguity is not a unique China problem, but policy uncertainty is critically high as evidenced by the rule changes so far this year. The economic policy uncertainty (EPU) gives a clear picture that 2015 saw significant uncertainty. This uncertainty declined in the last quarter and stocks gained. With the uncertainty this year, stocks fell. 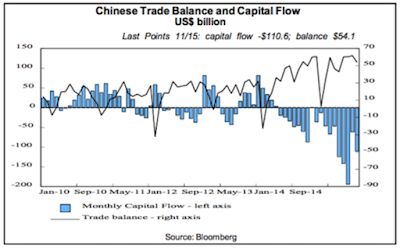 Capital outflows increased in the summer and slowed when the uncertainty index fell. China financial diaspora whereby wealth is moving to new havens around the world where uncertainty is more controlled will continue as long as the rules of game are not clear. Talent will also move with this money. The choice is either better rules or more controls. The China uncertainty effect is spilling over to financial assets around the world. If the technocrats of China do not have control of their financial system, how can other places cope? There is no exogenous business cycle risk that can easily explain the current sell-off. This is the policy uncertainty bear market. 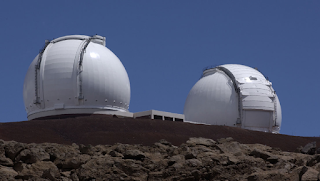 I hope it will not shock experimental physicists too much if I say that we do not accept their observation unless they are confirmed by theory. We should make this very simple. If there is no explanation or theory for the numbers in a systematic model, there should be no faith in their ability to be repeatable. Statistics without theory have no meaning. Investors should be able to get comfortable with back-tested data provided the work is done carefully and if the results can be described through a theory. If you are a trend-follower, you should have an explanation for why markets trend. If there is an alpha strategy for hedge funds, you should be able to explain why the alpha is exists and whether it can be arbitraged away. You should be able to differentiate between skill, luck, structural advantage. We can go so far as to say that skill without a story should not be believed. Repeatable results are only those that can be explained with a theory. 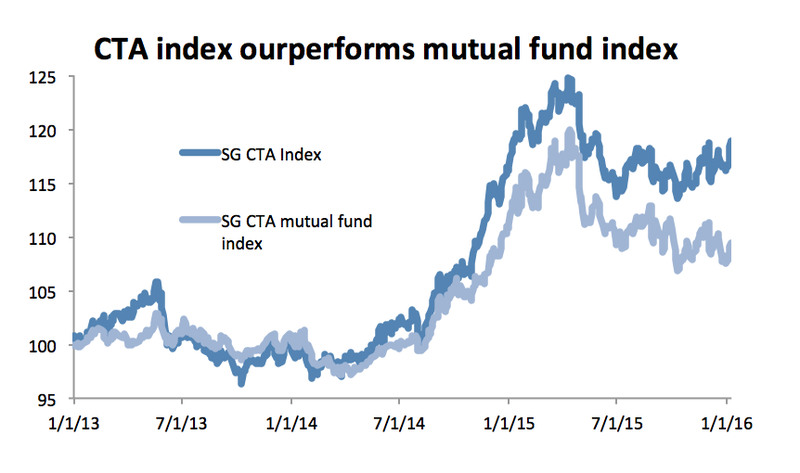 SocGen's new CTA mutual fund index - Is it different? 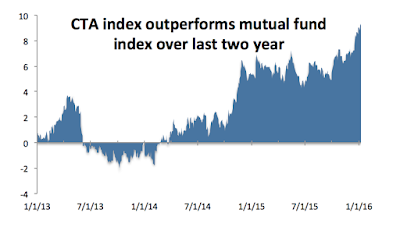 The '40 Act mutual fund space has grown significantly for CTA's and this sector now has its own index. It is not the same as the SocGen CTA index that has been reporting returns for the last fifteen years. A comparison between the SG CTA index and the SG CTA mutual fund index shows there is value in moving looking outside the mutual fund area. There are more managers to choose from which adds diversification from more styles of managers, timing of trades, and markets traded. Starting a new index is never easy. You have to figure out the criteria for the constituent managers and actually back-fill to provide some history. The result of this construction is a new index which may not track the performance of similar existing indices. The existing CTA index has 20 managers while the new mutual fund index has 10 managers with a minimum size in the mutual fund AUM of just under $100 mm. There are only two names that overlap. Both are equally weighted. Our first chart shows the cumulative performance for the SG CTA index versus the CTA mutual fund index for the entire back-filled period, 2013 to the present. The old CTA index and the mutual fund index matched closely through the fall of 2014 but then show increased differences that currently persist. The overall correlation is approximately .86. A review of the managers may suggest that the broader index has more specialty programs in sectors such as commodities and FX. The added diversification from more managers actually led to better performance. 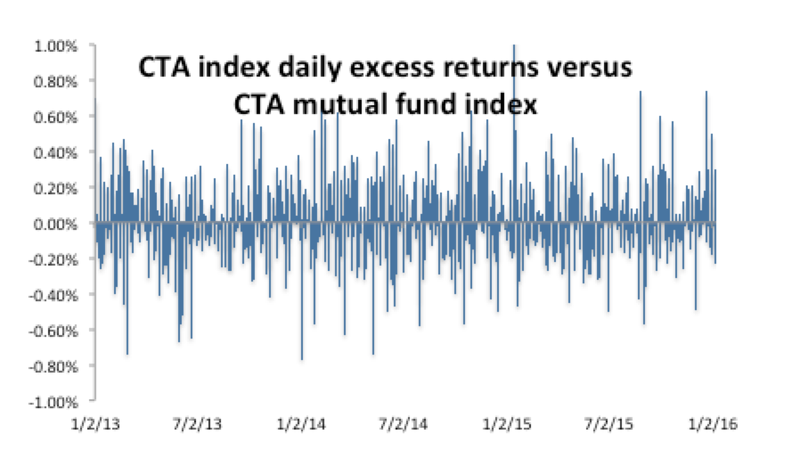 The daily excess returns are obviously biased positive given the overall gain with the CTA index but there is a range of differences that fall within 50 bps up or down. While the '40 Act CTA business has increased significantly over the last few year, there is still more choice available in traditional structures especially if you move outside the diversified trend-following space. We expect the gap between these two indices to close, but a broad search of managers may prove more useful for those investors who want high performance or more diversification. When discussing efficient markets, the one thing that we know is true is that prices will adjust quickly to new information. Markets may make mistakes but they will occur quickly. There an be under and over-reaction but there is still reaction to new information. This immediate reaction is one of the reasons that policy-makers are often so careful about what they say and do. A wrong move and the markets will send a signal immediately. That kind of feedback is not always what policy-makers want to hear and the reaction may have follow-through. The information accumulated will have an impact on longer-term prices. The markets are sending signals to China policy-makers and it is saying that there are issues with current policies. Circuit breakers - First in and then thrown out. Investor market reaction is further exiting from stocks on this uncertainty. Circuit breakers are supposed to give investors time to assess market conditions, but that does not mean investors will be happy after the assessment is made. A large fear with circuit breakers is the potential for them to be absorption barriers. As prices get close to the circuit breaker levels, there is a pull to the barrier as investors try to beat the crowd before the market closes. The barrier becomes self-fulfilling. Restricted sale by shareholders - Added in the summer with an end date in January 2016. Now the rules have been changed to continue the policy. There is no certainty of market structure for large investors. Communications - No active open discussion on the market and regulatory environment. This causes market fear and uncertainty. Policy-makers are afraid of miscommunication but the lack of information sends a signal. Foreign reserves - Foreign reserves have further declined which suggests that they are being used to defend the yuan from a faster fall. Capital outflows are a problem given the above issues and the same concerns that investors have about all EM countries. Again, the signal has been that tighter controls may be in order. Investors will head to cash when there is true uncertainty and not just volatility. There are exogenous factors which can explain the stock market decline in China, but there are also endogenous behavior that has exacerbated the issue. The "Reach for yield" has turned into the "stretch to safety"
The post-crisis zero interest rate period was all about the reach for yield. One of the purposes of the Fed's zero rate policy was to get people to spend their money and not save. For those that still wanted to save, the objective was to get investors to put their money to use through riskier investments. Get money out the mattress of safety and into new investments that will serve as a catalyst for growth. Zero rates are now over, so the discount rate for any investment project should be higher and the present value should be lower. Projects that seemed worthy as a stretch for yield now do not seem to make as much sense. If the Fed policy states that rates are to be normalized, then the marginal project should be rejected and current investments may not seem as economical. 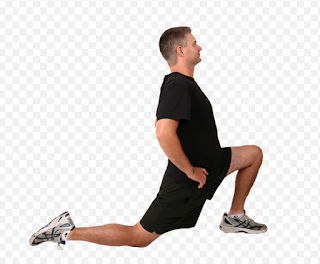 There is less reach and the movement should in the opposite direction. Investors will stretch for safer investments. Interest rates represent the time value of money and the price of risk. If the Fed keeps rates too low, then the price of risk is distorted and the time value of money does not make sense. Higher rates means that the price of risk should go up because rates are not be artificially held at zero. Of course, there is still the issue of what is the neutral rate and whether it is or should be below zero, but the price of risk should always be positive. We are seeing the effects of the change in Fed policy. The price of risk for junk has gone up. The price of risk in the stock market has gone up. The investments that were a reach for yield have reversed. We should also see this start to occur in real estate. The stretch will be for safety until top-line cash flow growth seems appropriate for the new price of risk. 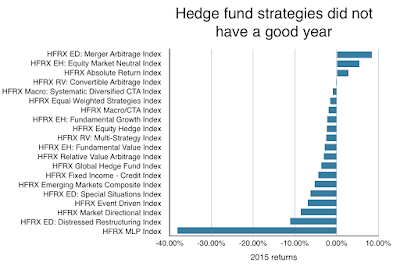 The rankings of hedge fund strategy index returns for 2015 show a lot of negative numbers. It was not a good year. 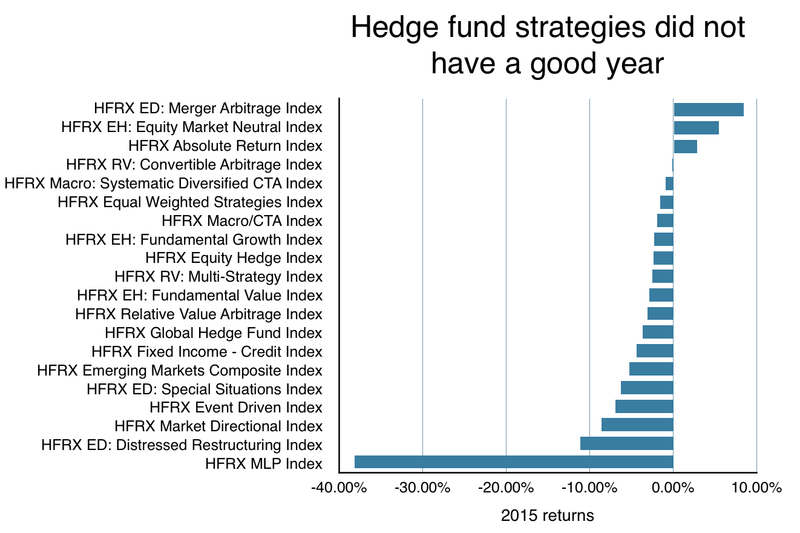 Most strategies underperformed the Barclays Aggregate and 2/3rds did worse than the S&P 500. Hedge fund did not hedge. Fixed income did not find the sweet spot and global macro did not find the major market trends. The only winners were merger arbitrage given the large deal flow, equity market neutral, and the absolute return index. Managed futures and global macro did better than most strategies, but these strategies were not able to find big pay-offs and missed the big fixed income, commodity, and foreign exchange opportunities. Of course, some individual managers did well, but the central tendencies are what drive expectations and allocation decisions for managers. 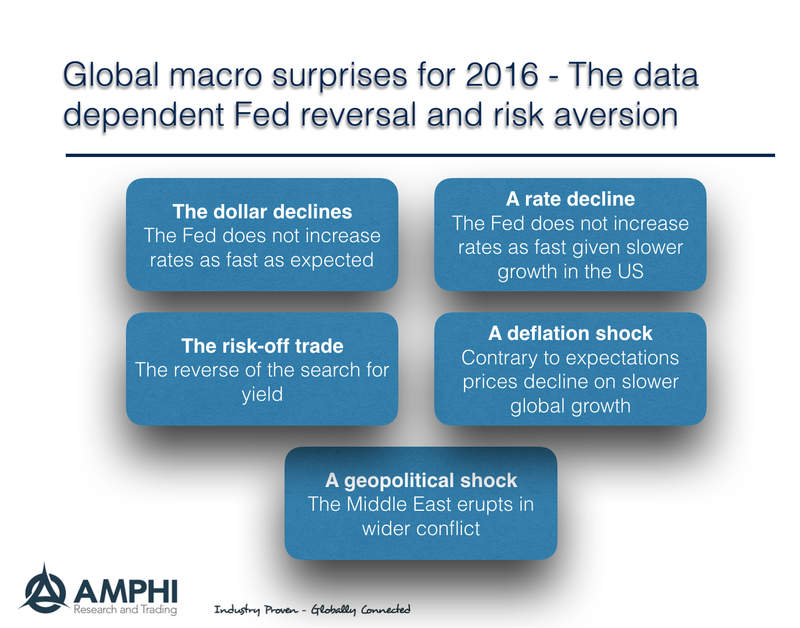 The year was filled with surprises and big divergences, but most of them were policy-made and highly unpredictable. This is a small table highlighting some of the ones that we think caught investors napping. The main theme last month was whether the Fed was going to raise rates. It did the job. It also presented the SEP "dot plots" for the new year which suggested that four Fed increases would occur in 2016. The story is not switched to not when will the Fed start normalization but how will it occur. The "data dependent" Fed focus will mean a higher sensitivity to economic data and higher market volatility. Larry Summers began the year with a strong editorial on secular stagnation. The slow growth in the US and the rest of the world should cause all investors to take a closer look at his arguments. 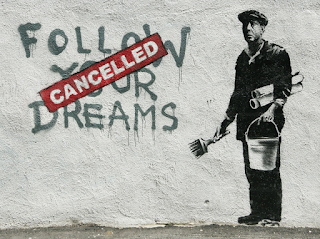 A world of global secular stagnation is very real. If rates are going to move higher, then the reach for yield may be over. It is more likely investors will be stretching for safety. We are more likely to be in a RO/RO environment like the period between QE's. A world without QE is not the same as a world with it. I hate to be a pessimist but fading consensus and being more negative may be the right play for 2016. Effort and results were not linked for managed futures managers in 2015. For all of the trends, opportunities, and trading, the SOCGEN CTA index ended the year up 10 bps. Going to sleep for the year with money in a mattress would have gotten the same return. Nevertheless, equities as measured by the S&P 500 stock index (SPX) fell less than one percent while bonds as measured by the Barclay Aggregate Index (AGG) gained just less than 50 bps. It was a sideways year in spite of the historic change in Fed behavior, significant oil shocks, and negative interest rates in the EU. A closer look at the monthly returns show an interesting story for how and when managed futures managers made profits and lost money. Of course, we are generalizing, but we believe a simple comparison with traditional assets can tell an effective story. 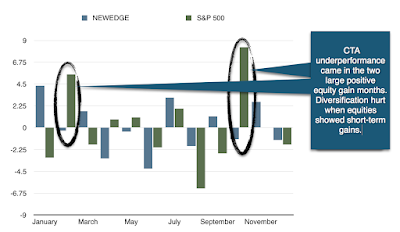 Looking at equities, there were two big positive return months, February and October. 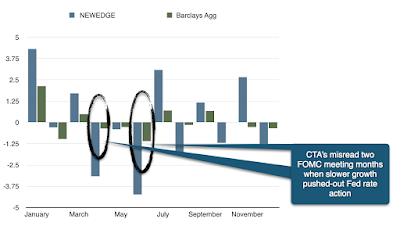 During these months, managed futures posted loses. The power of diversification hurt the CTA's holding diversified portfolios. In the down equity months, CTA's performed better albeit not always with positive gains. 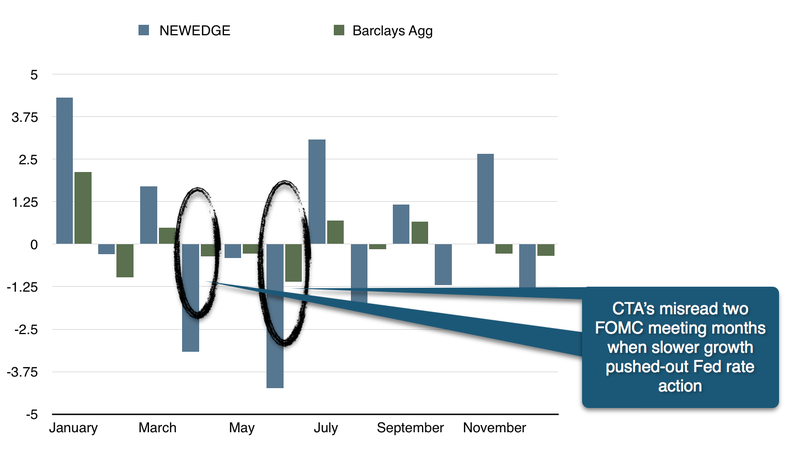 Relative to bonds returns, the managers in the CTA index were caught wrong-footed in two months, April and June. Both of these months were periods when expectations of a Fed increase were not realized. The FOMC meeting results between March and July disappointed the markets. Investors in the first half of the year fully expected a Fed rate increase, but the slow GDP growth numbers from the harsh winter changed Fed plans and caught many traders by surprise. 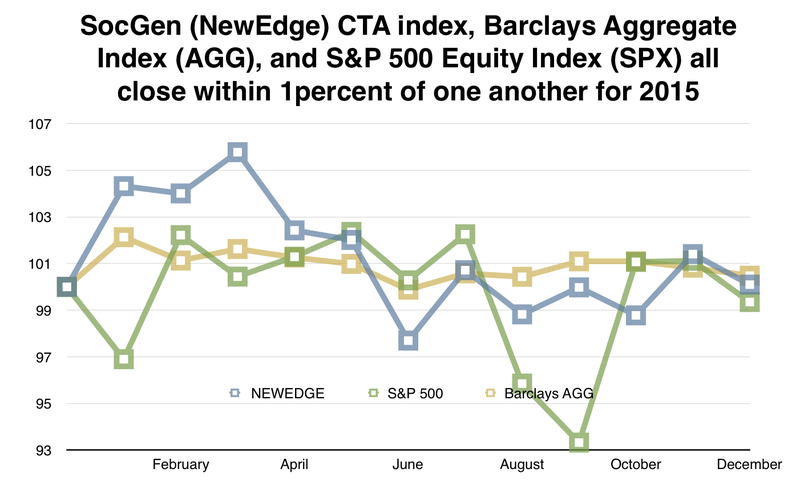 In this context, CTA returns were flat for the simple reason they were too diversified at the wrong times and missed some key market moves in the second quarter. The second quarter loses gave back the early gains during the first quarter. 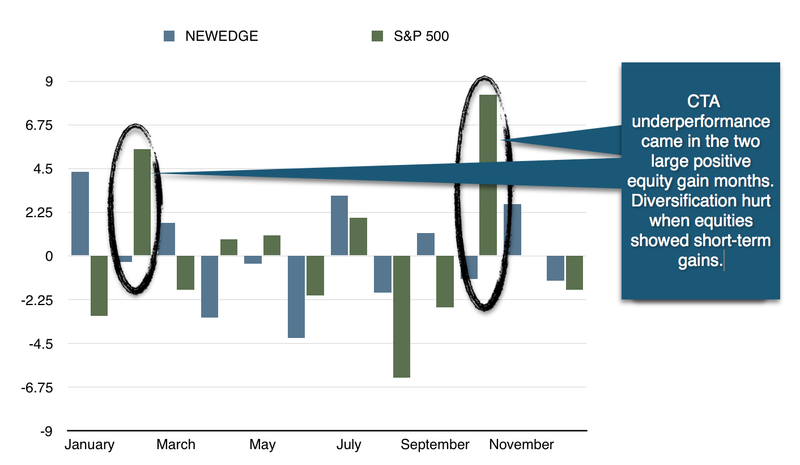 The rest of the year was a push with good months followed by profit give-backs. While managed futures strategies are considered long volatility, there needs to be sustained divergences for longer-term gains. This is why we classify managed futures as a divergent strategy and not just a long volatility strategy. 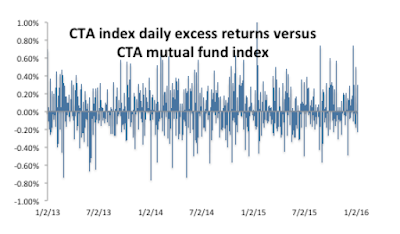 Volatility is necessary but not sufficient for a good CTA return year. Instead of predictions of what will happen, it may be a good idea to talk about where there will be surprises. A surprise is an event that is contrary to the consensus of the market. There are five that will be the key focus of the year. We are not saying that any will occur, but argue that these are events or market reactions that will surprise the consensus. The dollar declines - The consensus is that the Fed is tightening and raising rates while the rest of the world is easing. This is all true, but if the Fed does not follow its path of increases, a dollar reversal will be the trade in foreign exchange. Is this dollar decline likely? The Fed has generally predicted a faster increase in rates over the last few years only to go slower than expected. History tells us four Fed increases per the SEP dot forecasts is aggressive. A rate decline - With negative rates in the EU and the Fed expected to raise rates four times in 2016, the market bias is toward higher rates. This view is reinforced by the forecast that inflation will be higher and growth with continue at above 2%. Inflation is dependent on a labor market that will see real wages increase and growth that rebounds in 2016. Both are expected, but it would be unusual to see these twin forecast realized even though we are at 5% unemployment. There is still labor market slack with low participation rates. A deflation shock - Whether called secular stagnation, a balance sheet recession, or a continued zero bound problem, there is little to suggest that inflation will touch the 2% level. While continued momentum with an oil shock is less likely, there are limited places in the economy which show upside price pressure. The risk-off trade - The last few years have been the focus of a search or reach for yield. This has burned investors who increased exposure in small cap stock or who bought junk bonds and moved to riskier credits. Cash levels have increased in spite of low rates. Given the level of uncertainty and lack of market confidence, the risk-off trade may be the surprise in portfolio construction. A geopolitical shock - Whether immigration, the Middle East, or the South China Sea, the markets did not react to events in 2015, but still face significant geopolitical risks. The new year eruptions associated with the executions in Saudi Arabia can easily turn into a much bigger problem for the region and the globe. If you are a managed futures trend-follower, you need market dislocations, divergences, to make money. You follow a mean-fleeing strategy. Most managers futures managers can be classified in this manner. If there are no market moves, that is, markets are range-bound, trend-followers will not have any viable opportunities. If we look at the moves for 2015 in the futures markets, it is clear there were limited long opportunities. The major potential trends were from the short-side in the energy and metals markets. Unfortunately, these markets are usually the most volatile and have smaller weightings in the portfolios of most managers futures managers. The high volatility of these markets also makes it more likely to be stopped-out of positions or harder to find trend identification. Clearly, it is hard to extrapolate from year over year changes but even a high level examination tell us that there were limited opportunities. For all trend-followers, there is a cost of trend identification both for entry and exists. If an arbitrary but reasonable threshold of 10% as the total entry and exit costs of trend identification is used, the number of market opportunities from the long side were almost zero. The largest markets would all fall under the threshold and the largest potential gains were from the short-side. Given this information, it is not surprising that the majority of managed futures managers, especially those who are diversified trend-followers did not have a good year. The framework of convergence and divergence is useful to describe markets and hedge fund styles. 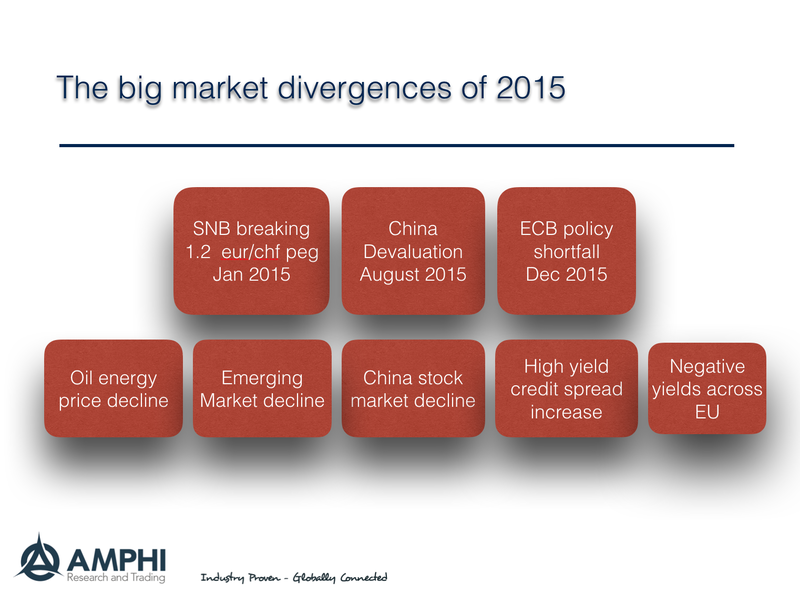 With this framework, we can focus on the big events of 2015 as market divergences. There were by my count eight unexpected market moves that were mean-fleeing. 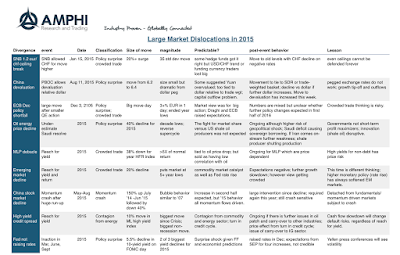 All were surprises that caused major market dislocations. These events were the biggest opportunities and risks for the year. 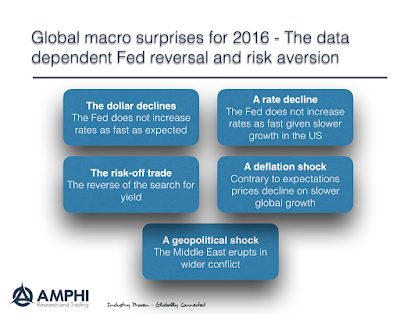 There were three key global macro shocks that had an immediate impact on markets. All were surprises in government policies. The year started out with the Swiss National Bank ending its euro/chf peg. This single event led to the failure of a number of hedge funds and hurt many trend-followers in January. The China devaluation in August was another currency surprise that was one of the reasons for the August market sell-off. China risks were much greater than anticipated. The third policy shock was the limited ECB monetary action in December. The market was caught surprised by a less aggressive policy announcement from ECB president Draghi. 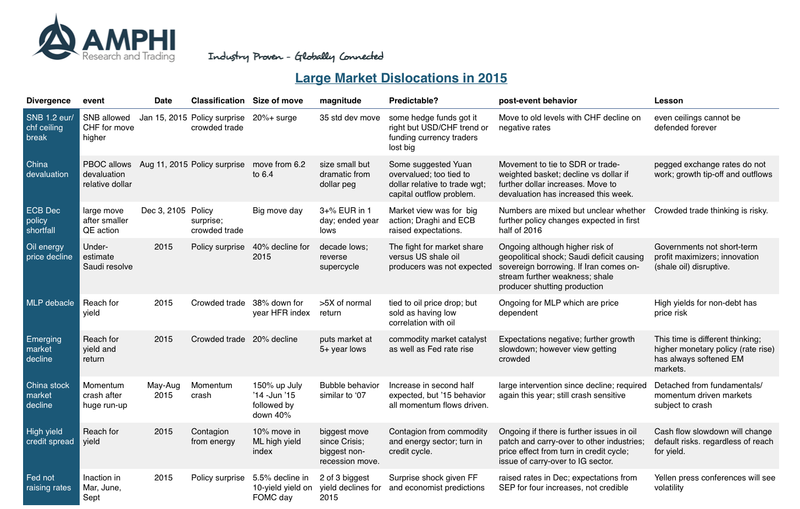 There were five big market divergences that developed through the year. Four of the five were associated with price declines. The oil market declined by approximately 40% in 2015 with additional broad declines in natural gas, coal, heating oil, and gasoline. 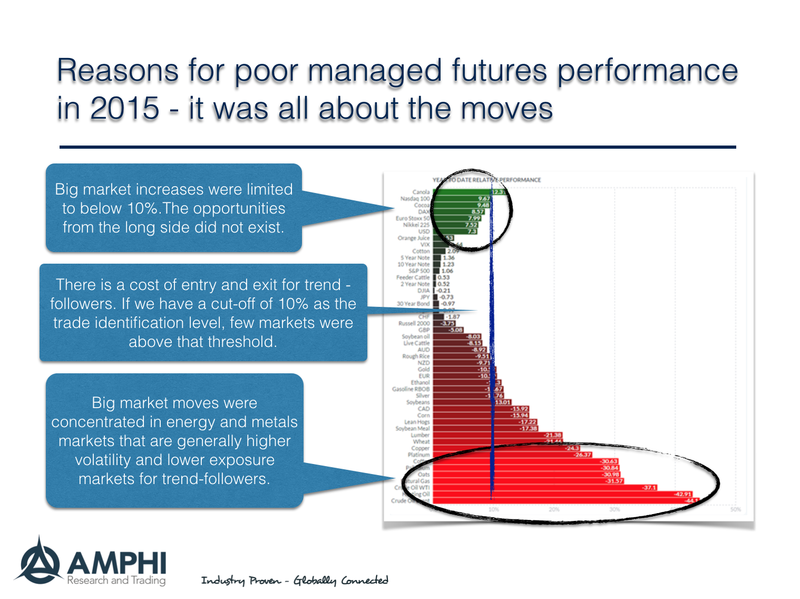 The MLP market was a significant loser because of the energy price declines. The continued sell-off in commodity markets and slowdown in EM growth rates spilled-over to further declines in emerging market bond and stock markets. The China stock market saw crash declines that were only arrested though significant government intervention. The credit markets turned down with signifiant gains in high yield spreads. The only real surprise price gains was in the EU bond markets. 40% of EU sovereign debt is now paying negative interest rates. Generally, it is harder for investors to profit from price declines, so long-only buyers were hurt by all of these negative divergences. Surprises and divergences were not centered on the upside leading to a poor return year for most investors. In spite of all of the advancements in quantitative tools and the use of computers and large databases, effective investment management is not about technique but rather about the process of meeting financial goals. Since some of the risks faced by investors are not quantifiable, a focus just on tools and numbers is insufficient to gain success. The advancements of finance have been able to better formulate the investment problems, but does not always provide solutions. We have a better understanding of factors and can better decompose alpha and beta, but we are no better at predicting what will happen to factors such as growth and inflation over time. 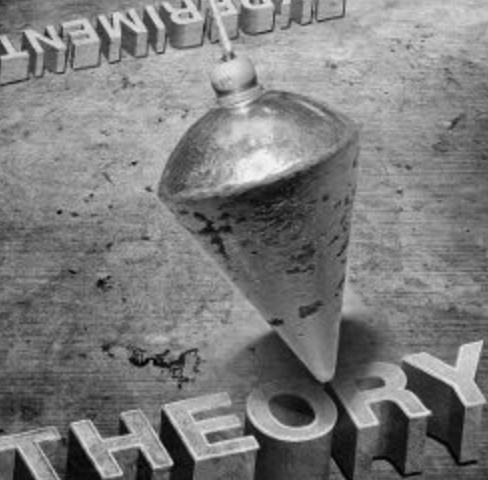 There is still significant room for theory, testing, and analysis - the science of investment management. I don't know whether Churchill was a good investor. He always had money problems and was forced to write to pay the bills earlier in his life, but he does seem to understand the essence of what it takes to be a good investment manager. Perhaps those who find investment management difficult and have failed at different times better understand the genius of investment management. 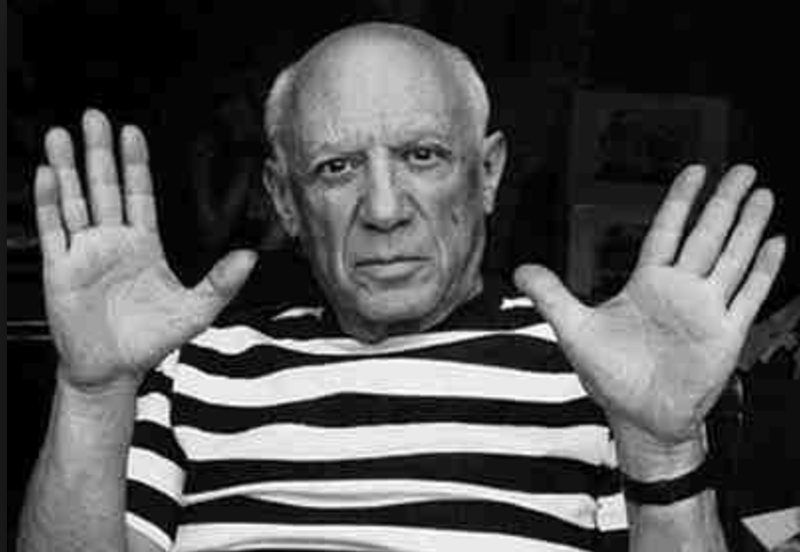 The genius is learning not to be over-confident about the what can be understood from conflicting information. There is genius with saying you don't know or that you are confused and having the courage to step-away from taking risks. 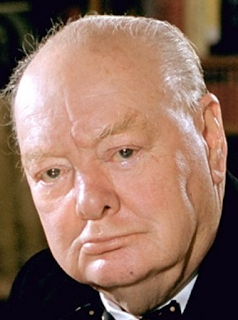 May everyone show genius with the uncertainty of 2016. 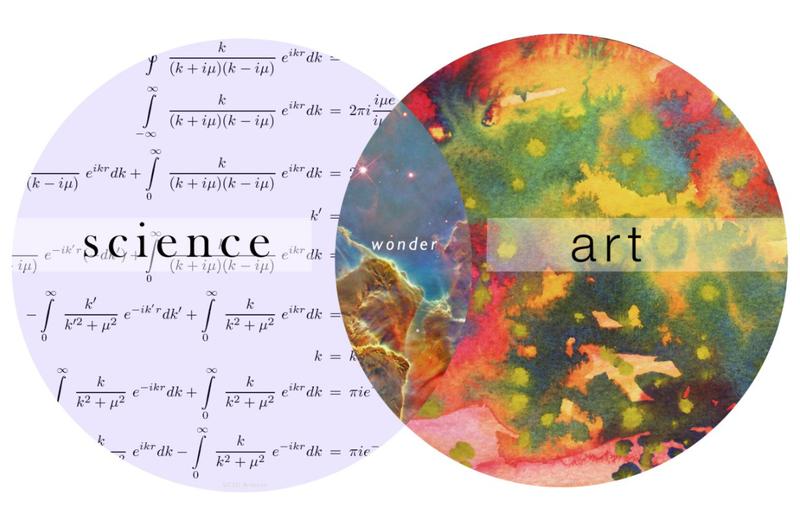 Investment science and art - where is the intersection? The same could be said for investing. There is the portion of investing that can be rules-based and explained to a computer. It could be the Fama-French model of betas. It could be a set of rules for finding trends. It could be the risk management that measures portfolio volatility. However, this is often not enough to generate high returns. Advanced investment science now is the revolution in smart beta, but even if we can decompose the return of a fund through smart betas, there is still a lot of the variation that cannot be explained. This is caused by the art of investment management. It is the job of investment analysts through their due diligence to make sense of this art and find the unique intersection between it and the science of investing. Computers are boring. They only give answers. Predictions for the new year are about the same. They only give answers for what may be the wrong questions. I think there are only three questions for the year. I keep it three to ensure it is very simple. One policy, one environmental, and one behavioral. The policy question is the follow-through question from 2015. In 2015, the issue was when would the Fed raise rates. The 2016 question is how will they further raise rates. The behavioral question is also simple. The last few years was determining how investors would reach for yield in a zero rate environment. 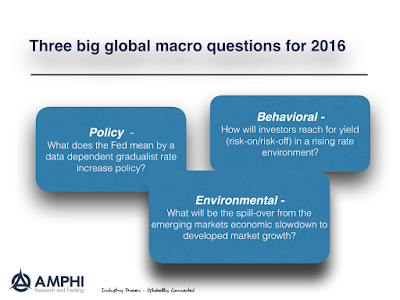 The 2016 question is determining how investors will react to a rising rate environment. The reach for yield may actually be more like the RORO (risk-on/risk-off) environment of 2010-2011. 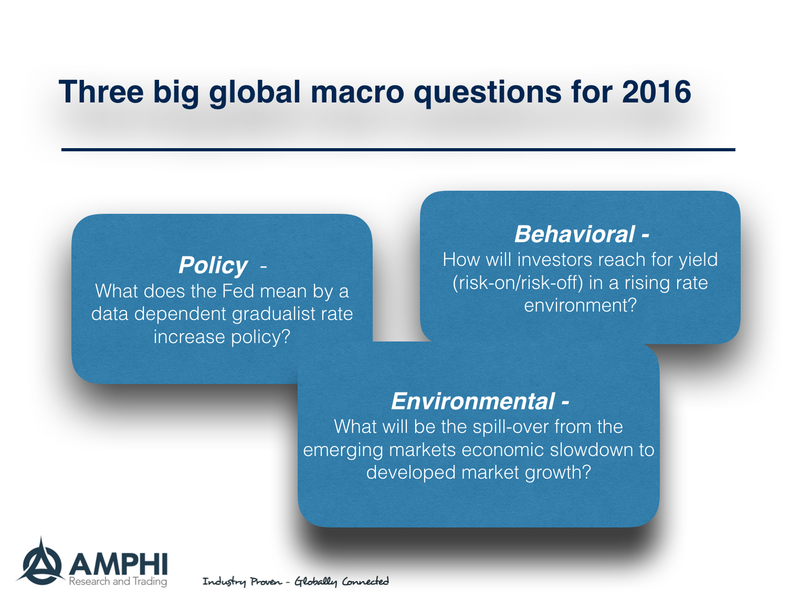 The third question is focused on the macro-environmental. 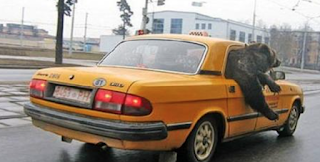 How will the emerging market slowdown spill-over to developed markets? China trade is bigger than the US. EM economies are a bigger percentage of the world total. How will a slowdown feedback on the the US and EU through trade, capital flows, and risk-taking? Forget the broad predictions. Answer these three questions.